George Raymond Richard Martin , sometimes referred to as GRRM, is an American author and screenwriter of fantasy, horror, and science fiction. He is best known for A Song of Ice and Fire, his bestselling series of epic fantasy novels that HBO adapted for their dramatic pay-cable series Game of Thrones. Martin was selected by Time magazine as one of the "2011 Time 100," a list of the "most influential people in the world." George R. R. Martin was born on September 20, 1948 in Bayonne, New Jersey the son of a longshoreman, whose working class family lived in a federal housing project near the Bayonne docks. He attended, but did not enjoy his time at Marist High School, though he would later acknowledge that it was during those critical years that he developed his lifelong interest in the superhero genre, notably the Marvel Comics titles. As a youth, Martin became an avid reader and collector of 1960s Silver Age superhero comic books. Fantastic Four #20 features a letter to the editor he wrote while at Marist. He credits the attention he received from this letter, as well as his interest in the era's emerging comics fandom and its fanzines, with his pursuit of becoming a professional writer. In 1965, while a teen, Martin won an Alley Award for his amateur super-hero text story "Powerman vs. The Blue Barrier," the first of many awards he would go on to win for his fiction. Martin began to write science-fiction short stories in the early 1970s. His first story nominated for the Hugo Award and the Nebula Award was With Morning Comes Mistfall, published in 1973 by Analog magazine. In 1976 for Kansas City's MidAmeriCon, the 34th World Science Fiction Convention , Martin and his friend and fellow writer-editor Gardner Dozois conceived of and organized the first Hugo Losers Party for the benefit of all Hugo-losing writers, their friends, and family to commiserate the evening following the convention's Hugo Awards ceremony. Martin was nominated for two Hugoes that year but wound up losing both awards, for the novelette "...and Seven Times Never Kill Man" and the novella "The Storms of Windhaven", co-written with Lisa Tuttle. The Hugo Losers Party became an annual Worldcon event thereafter, its formal title eventually evolving into something a little more politically correct as both its size and prestige grew. Although much of his work is fantasy or horror, a number of his earlier works are science fiction occurring in a loosely defined future history, known informally as 'The Thousand Worlds' or 'The manrealm'. He has also written at least one piece of political-military fiction, "Night of the Vampyres", collected in Harry Turtledove's anthology The Best Military Science Fiction of the 20th Century. During the 1980s Martin also began to write for television while continuing his career as a series book editor. For television, he worked in Hollywood on the revival of Twilight Zone and the dramatic-fantasy series Beauty and the Beast. As a book series editor, he oversaw the development of the lengthy Wild Cards cycle, which takes place in a shared universe in which a small slice of post-World War II humanity gains superpowers after the release of an alien-engineered virus. In Second Person Martin "gives a personal account of the close-knit RPG gaming culture that gave rise to his Wild Cards shared-world anthologies". Martin's own contributions to the multiple-author series often feature Thomas Tudbury, "The Great and Powerful Turtle", a powerful psychokinetic whose flying "shell" consisted of an armored VW Beetle. Twenty-one volumes had been published in the series as of June 2011. Earlier that year, Martin signed the contract for the twenty-second Wild Cards volume, to be called Low Ball when published by Tor Books. Martin's novella, Nightflyers, was adapted into a 1987 feature film of the same title. Martin was also a college instructor in journalism and a chess tournament director. In his spare time he collects medieval-themed miniatures, reading and collecting science fiction, fantasy, and horror books, and treasuring his still-growing comics collection, which includes the first issues of Marvel's "silver age" Spider-Man and Fantastic Four. On February 15, 2011, Martin married his longtime paramour Parris McBride during a small ceremony at their Santa Fe, New Mexico home; the couple exchanged custom made, Celtic-inspired wedding rings made for them by local artisans. Area friends were in attendance and helped them celebrate the occasion. On August 19, 2011, they held a larger wedding ceremony and reception at Renovation, the 69th World Science Fiction Convention, in Reno, Nevada for their larger circle of friends within the fantasy and science fiction fields. In 1991 Martin briefly returned to writing novels, and began what would eventually turn into his epic fantasy series, A Song of Ice and Fire , which will run to at least seven volumes. The first volume A Game of Thrones was published in 1996. In November 2005, A Feast for Crows, the fourth book in this series, became The New York Times #1 Bestseller and also achieved #1 ranking on The Wall Street Journal bestseller list. In addition, in September 2006, A Feast for Crows was nominated for both a Quill Award and the British Fantasy Award. The fifth book, A Dance with Dragons, was published in July 2011, quickly becoming a huge international bestseller, including a #1 ranking on the New York Times Bestseller list and many others. The series has received critical praise from authors, readers, and critics alike. 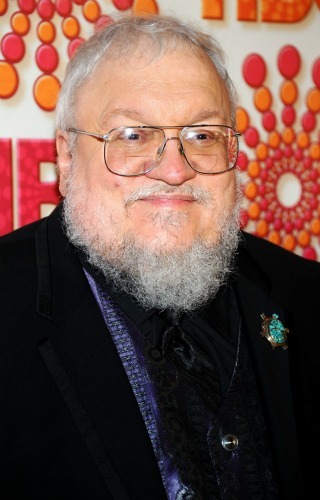 During completion of A Dance With Dragons and other projects, George R. R. Martin was also heavily involved in the production of a television series adaptation of the A Song of Ice and Fire books named after the first book, A Game of Thrones. Martin's involvement included the selection of a production team and participation in scriptwriting; he is listed in the opening credits as an executive producer of the series. HBO Productions purchased the television rights for the entire A Song of Ice and Fire series in 2007. Game of Thrones began on April 17, 2011 and ran weekly for ten episodes, each approximately an hour long. The first season covered events that occurred in the first novel in the series. During the run-up period in the months before the first season premiered, numerous advance trailers and behind-the-scenes short features were shown on HBO and made available at various Internet sites. This was part of HBO's extensive media blitz promoting one of their most expensive premium cable series to date, estimated to have cost more than 60 million dollars for the first season. On Sunday April 3, 2011, two weeks before the premiere of the series, HBO showed the first 14 minutes of the first episode, further ratcheting up expectations for the new series. Two days after its premiere on April 17, 2011, HBO announced that Game of Thrones had been renewed for a second season, following universally positive reviews and an initial viewership of 4.2 million during its three debut evening showings; by the end of the first week, nearly nine million had viewed the first episode. Not long after the series' first season finale, it was announced the show had received 13 Emmy Award nominations, including Best Dramatic Series and Best Supporting Actor; the series won two of those Emmy Awards, for Best Supporting Actor and for Best Main Title Design. Whole or part of the information contained in this card come from the Wikipedia article "George R.R. Martin", licensed under CC-BY-SA full list of contributors here.